I found myself making art in 1994 after a major life change occurred. I suppose it was my therapy. I had always been a collector of unusual objects and was attracted to bold colors and kitschy religious objects. Suddenly I felt a strong urge to take these things and playfully put them together. I remember waking up in the middle of the night and beginning work on 3 to 4 mixed media pieces at the same time. My bed was surrounded by boxes of materials from the scrap metal yard and my dumpster diving finds. I made little pathways so I could get to the closet and bathroom! 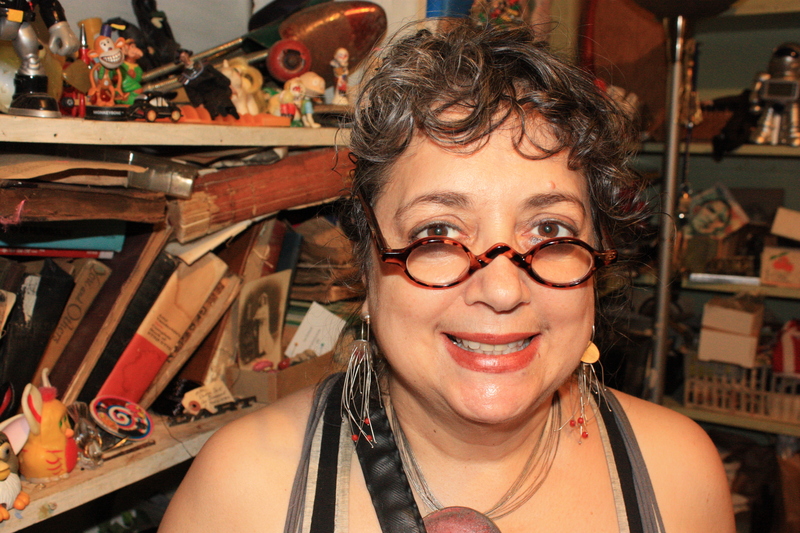 An energetic passion to create from found materials became a driving force in my life. Looking back, I know now that I was fulfilling a deep need to play, while figuring out what this life is about (still working on that one). It was a very thrilling, exhilarating, experience, which I still feel today several years later. My artwork is motivated by the materials that I love. In the beginning my pieces were purely decorative with a sense of humor. Then they started to become more autobiographical and political. They express my feelings about the state of the world, aging, loss, history, and living a life of purpose and spirituality.